The revisions to the new edition are purposely kept minimal in order to retain the book's unique tone, wit, and charm. A new Glossary of the grammatical terms used in the book provides a convenient reference for readers. The discussion of pronoun use is revised to reflect the contemporary concern with sexist language. In addition, there are numerous slight revisions in the book itself which implement this advice. 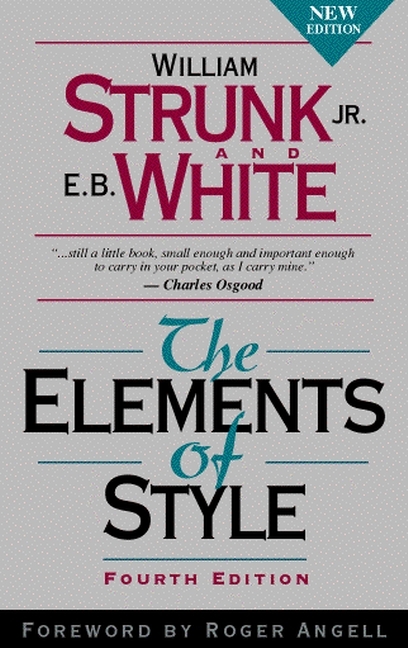 A new Foreword by Roger Angell reminds readers that the advice of Strunk & White is as valuable today as when it was first offered. This book has conveyed the principles of English style to millions of readers. Use the fourth edition of “the little book” to make a big impact with writing. How to cut deadwood out of your sentences. How enliven your prose with the active voice. How to put statements in the positive form. A new Glossary of grammatical terms. A new Foreword by Roger Angell. The classic principles of English style.